At an onsen resort people enjoy bathing in spas, particularly open-air baths called roten-buro that are found in natural surroundings. Some roten-buro are set in nature as if they are part of a river, while others are in beautiful gardens. Sometimes you’ll see wild animals, such as monkey families, come to a roten-buro to take a bath together. 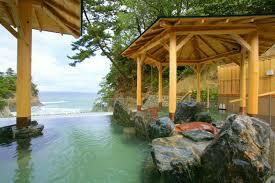 You could also enjoy the massaging function of bubbles in an awaburo, or the pelting water of an utaseyu. 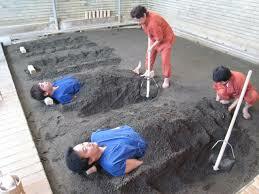 Hot rock plates, ganbanyoku, and sand baths, sunaburo, are also popular bathing styles.